FIAT Chrysler Automobiles Serbia (Serbian: FIAT Krajsler Automobili Srbija), previously known as Zastava Automobiles, is an automobile manufacturing company based in the city of Kragujevac, Serbia and widely known for its Fiat-based automobiles, which it began assembling in 1955 for Eastern European markets. It became a subsidiary of Fiat in 2008, once fully bought by the Italian car manufacturer, and was renamed to Fiat Automobili Srbija (or Fiat Automobiles Serbia). Then the company became a subsidiary of Fiat Chrysler Automobiles in 2014 following the merger, then shut down of Fiat S.p.A..
On July 28, 2008, Fiat signed a letter of intent, undertaking to take control of the automobile division, investing €700 million in return for a 67 percent stake in the company (then owned by the state) and an additional €100 million of investment from the Serbian government. This was later revised to €300 million. Fiat pledged not to cut any jobs and to make good a backlog in wage payments for employees and hinted that the plant may become a dedicated Fiat production site. With this major investment, production was set to reach 330,000 units by 2012. 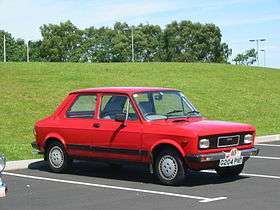 Initially, the company was best known for its locally built versions of the Fiat 128 and Fiat 600. During the 1970s and 1980s, Zastava sold its compact cars in North and South America and Western Europe under the "Yugo" brand. Its final model, the Yugo Sana, was styled by Italian designer Giorgetto Giugiaro and launched in 1990, but its production was cut short by the Yugoslav wars. By the same time the Yugo brand had disappeared from most Western markets by 1993. In 1999, the factory was damaged by NATO bombing during the Kosovo War. The post-Yugoslav era has been difficult for Zastava, just as most of the other major companies based in Serbia, which suffered from hyperinflation, international sanctions, and economic mismanagement. As a result, the production almost stopped and the company failed to introduce new models for a long time. In September 2005, the company signed a new agreement with Fiat to produce a version of the 2003 model Fiat Punto for the Balkans under the name Zastava 10, with a capacity of 16,000 units yearly. In December 2007, Serbia announced that Zastava would be privatized in April 2008. Promotional material depicting Zastava factory. Particular emphasis was added on making clear Yugoslavia was not aligned with the USSR. The roots of Zastava lay in the 1851 founding in Kragujevac of the Vojno-Tehnicki Zavod (Army Technical Institute). The institute developed a cannon foundry division in 1853, becoming a military vocational school in March 1854. During the 1880s, Zastava also begin with the production of firearms. At the end of the 19th century the cannon foundry changed its name to the Military Engineering Works. The firm rapidly expanded its production program and the complexity and quality of its products. In 1904, within the company, a section dedicated to automobiles is inaugurated. Beside repair services, certain car parts are also manufactured. In 1939 it begins assembling Chevrolet military trucks. The production came to a halt in 1941 with the Axis invasion of Yugoslavia and by then, 400 trucks came out of the factory which consisted of a working force of 12,000 men. After World War II, the plant was renamed Zavodi Crvena Zastava ("Red Flag Factories"). In a referendum held on August 26, 1953, 96% of the employees of then Zavodi Crvena Zastava voiced their desire to produce automobiles. That year, 162 Willys Jeeps would leave Kragujevac lines. On August 12, 1954 Zastava signed a cooperation agreement with Fiat . Three months later, Kragujevac began assembling Fiat 1400, Fiat 1100 B and Fiat AP-55 Campagnola. Fiat 1400 was Zastava's first assembled automobile, but Fića Zastava's licence built version of Fiat 600 is its iconic historical brand. 923,487 of Zastava 750 were produced over a span of 30 years, with several different engines and in various equipment levels, from October 18, 1955 through November 18, 1985. Total vehicle production in 1955 was 1,044 and by 1958 it had risen to 3,596. During 1957 and 1958 Zastava established a supplier network. Zastava outsourced engine manufacture to Rakovica-based engine manufacturer 25. Maj (DMB). Zastava's annual production climbed to 13,719 units in 1960. The company entered the new decade with a replacement for the 1400: Fiat's 1100, shown in Geneva as the successor to the 1100 B. 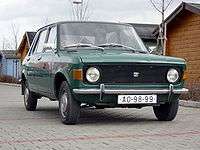 With the advent of the 1961 Fiat 1300/1500 came Zastava's 1300/1500 series, produced as both sedans and wagons. With all-around disc brakes, rear-wheel drive and up to 72 horsepower, the "tristać" was Yugoslavia's favorite upmarket car. Today, many across the former Yugoslavia recall the 1300 as Zastava's best automobile ever: the Jugoslovenski Mercedes as they call it. 201,160 copies of the 1300 and 1500 were produced from 1961 through December 20, 1979. The Fića had started life as the 16 kW (21 hp) 633 cc Fiat 600, designed by legendary Fiat engineer Dante Giacosa. In 1962, Zastava began production of the Fiat 600D, badged Zastava 750, boasting an 18 kW (24 hp) 767 cc engine capable of propelling the car to 110 kilometres per hour (68 mph). The floorpan of the 1300/1500 was used as the basis for the Polski Fiat 125p, which was produced by Polish FSO from Zastava CKD kits. The 125p was created by mating the body of the Fiat 125 to the mechanicals (engines, gearbox, transmission and suspension) of the 1300 and 1500. On the Yugoslav market, the 125p was known as the Zastava 125PZ. 1965 marked the official beginning of Zastava exports, with 6,000 cars sent to Poland. In 1967, Zastava produced about 52,000 trucks and passenger cars; in 1968, 53,000. Zastava in this decade signed a new contract expanding production and technological cooperation with Fiat. A $10 million investment pushed annual capacity to 85,000, with plans in place to reach 130,000 units within a five-year period. In 1969, the Zastava Kamioni (Zastava Trucks) division split from Zastava Automobili and began producing Italy's Om trucks, rated for between 2.5 and 4 tons. Today, Zastava Kamioni continues to make trucks through a partnership with Iveco. In 1970, Zastava rolled out the 750M, fitted with a new 767 cc engine boasting a thermostat-controlled pressurised cooling system. In the beginning of the seventies Zastava made arrangement with Fiat to produce Zastava 101 (4 cyl, 1116 cc OHC, 55 hp, front wheel drive), which was based on Fiat 128. It had restyled rear panel and resembled a hatchback body style. This 3 and 5 door variant of Fiat 128 was specific to Zastava and was never released elsewhere by Fiat. It was said that model 101 should be produced in Yugoslavia for both Yugoslav and Italian market, and vice versa, in the Italian market would have been sold under the marque Innocenti. It was soon nicknamed Stojadin as a pun on sto jedan (101) (Stojadin is a male name, although folk etymology also associates it with sto jada, "a hundred woes", due to the poor performance and assembling). In spite of this negative record, the car was a good seller in the domestic market as there was a virtual monopoly. Yugoslavs used to buy it because of its moderate price, simple mechanics, cheap spare parts and low maintenance cost compared to other cars assembled in Yugoslavia. In 1979, Zastava 750S – (Special) was released which offered updated interior controls and switches, a new steering wheel and a sportier 22 kW (30 hp) engine which raised the car's top speed to 120 kilometres per hour (75 mph). In 1980, the Zastava 850 was launched, with a 23.4 kW (31 hp) 848 cc engine propelling it to 125 km/h (78 mph) and a fully synchronized transaxle. Production of the 750 and 850 continued through 1985 in L, LE and SC versions. In the mid-seventies, Zastava management decided to develop a new model, still based on the same Fiat engine. It was originally to be known as Zastava 102, but the name was dropped in 1981 and the car released as Yugo 45. It was styled by Zastava with some help from Fiat engineers. It was an updated body version of Fiat 127 with some elements of Fiat 128 and it followed the style of the Autobianchi A112 but with a more square appearance. Several variants were made, with 903 cc, 1116 cc, and 1301 cc engines. Later in the 1980s, Yugo was exported to USA and at the same time it went through several modifications, most importantly the adoption of a 5-speed gearbox. In the same decade, Zastava changed its branding name to Yugo and derivative models were renamed: original Zastava Yugo to Zastava Koral and Zastava 101/128 to Zastava Skala or Yugo Skala. The original numerical classification would remain unchanged for some export markets, as was the case for the United Kingdom. These were Zastava's best years in number of cars assembled; around 230,000 cars a year. Zastava cars were to be sold in 70 countries at the time, with 27,000 exported to Western markets. The factory also started to make trucks, under IVECO licence. In 1988 a new model was released called the Zastava Florida (known as Yugo Sana or Yugo Sana Miami, in some countries). Its exterior was designed by Giorgetto Giugiaro, with a body shape similar to a Fiat Tipo (1988) or Citroën ZX (1991). In the early 1990s, Zastava was affected greatly by the Balkan Crisis. The factory production became unstable because of a problem with supplies. Exports were impossible during those years, because of trade sanctions imposed on Yugoslavia. As a result, its cars disappeared from most foreign markets after 1992. Production stopped in 1993, even though there was a waiting list for Yugo cars. Between 1992 and 1995, it was under UN sanctions, and then between 1998 and 2000, it was under EU and US sanctions. As a result, many Zastava subsidiaries abroad were forced to cease trading, such as Zastava (GB) Ltd. in the United Kingdom and Yugo Cars in the United States. In 1999, during the Kosovo War, NATO bombed the factory in Kragujevac, Serbia because Zastava Arms was a major military supplier to the Serb government. Some of the car manufacturing buildings were damaged and numerous workers were injured. After the war, there were trade talks with Hungarian firms to assemble Yugos in Hungary, but no agreement was reached because of the Yugoslavian partner's hesitation. However, Zastava Trucks were assembled in Hungary, near Pécs, with IVECO engines. Yugos were face-lifted and new versions are introduced in the Belgrade International Motor Show in 2002. The new Yugo Koral IN had a 1,3l 80HP motor with Bosch electronic injection, the transmission designed by Porsche, slightly new internal and external design, improved safety, and lots of extra details which were missing from former models. The new generation of Yugo was granted a FIA certificate, so it was in compliance with European standards. In October 2000, Vojislav Koštunica became the new president of Yugoslavia (also a Yugo Koral owner) and soon after the sanctions against the country were lifted the export resumed. The production had fallen to a mere 9 percent of its pre-1990 230,000 vehicles annual capacity, with exports to around 4000 vehicles. The new Yugoslav government a $50 million reorganization effort in cooperation with the World Bank, which resulted in mass layoffs, and its intention to privatize the company. A new prototype for the Yugo Florida, known as Florida 2.0 (Also known as "Zastava Sedan"), was made, equipped with the same engine as in Fiat Bravo 2.0. 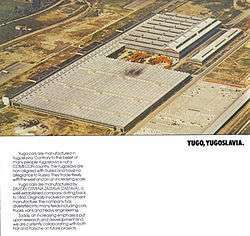 In 2002, the American entrepreneur Malcolm Bricklin, who had previously imported Yugo into the United States, signed a deal with Zastava to reintroduce the company's products into America. Bricklin's intention was to sell the cars for less than $10,000 under the brand name ZMW (as in Zastava Motor Works) which in the United States would be pronounced Zee-M-W. Even though a website proclaiming the brand's arrival was produced by Bricklin's company, by 2006 his intentions had switched to importing products from Chinese car maker Chery instead. Also there were produced some unknown models from the beginning of 90's and after 2000 as the respond of new market demands. Such models were: Yugo GV Turbo (90's), Yugo Electra (90's), Zastava Koral In (euro-concept), Zastava Globus Koral In (electromobile), Zastava Florida Caravan, Zastava Florida Sedan. Zastava automobiles have been sold and exported in Serbia, Bosnia and Herzegovina, Montenegro, Croatia, Macedonia, Greece, Bulgaria, Lebanon, Libya, Syria, Ecuador, Tunisia, Poland, and Egypt (where Zastava cars are produced under the marque of the state owned Nasr car company). CEO of Zastava cars Zoran Radojević has declared that the company has received offers from African countries for technology transfer. It is believed that Congo was interested in starting production of the Zastava Florida and Egypt of the Zastava 128. 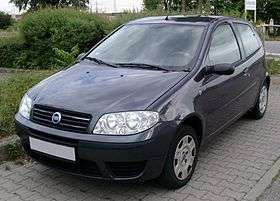 In October 2005, an agreement with Fiat was reached for production of the Fiat Punto by Zastava for Eastern European markets, which would be commercialed as the Zastava 10. The Koral IN L, with a fuel injected 1.1 L Peugeot engine, met the European Union safety standards in a test supervised by the German Technischer Überwachungsverein (Technical Monitoring Association). This was seem as a chance to pave the way for export to EU countries. The Zastava 10, based on the Italian Fiat Punto Mark 2b, was the last Zastava's most modern car before this factory was taken by Fiat. Optional features included dual front airbags and air conditioning, as well as power windows. Although the Zastava 10 was Zastava's newest and best model at that time, it faced fierce competition in its home market against cars like the Volkswagen Polo. However, it had some advantages over many of its rivals, including price. As of December 2007, Zastava 10 could be afforded starting with €7,550 in the Serbian market. In March 2007, the Zastava 10's share of the Serbian car market was 11% and the company started exporting cars to former Yugoslav republics in the first half of 2007, and with plans to add to Bulgaria and Albania as well. Production of all Zastava cars (Yugo, Skala 101 and Florida) ceased by November 20, 2008. After that day, the only car in production was to be Zastava 10 which has had its front part slightly modified and its name was changed to Punto Classic. In addition to the Punto Classic (ex-Zastava 10), Zastava was negotiating with Fiat for the production rights to another model not yet in production, a C-segment sedan, codenamed Project D200, to be manufactured for Fiat by Zastava and/or Tofaş of Turkey. It was considered to compete with the Dacia Logan. Fiat Group Automobiles (FGA) unit has signed a memorandum of understanding with the Serbian government for the acquisition of Zastava's Kragujevac plant on May 7, 2008. The memorandum of understanding foresees a new company being set up in which the Italian group would have a 67% percent stake and the Serbian government retaining 33% percent. The new company would make a total investment in the region of 700 million euros, with the government contributing 200 million euros to this. The Zastava plant would produce two new Fiat models, rejecting previous reports the plant could produce the 500 compact city car. The last Zastava branded car rolled out of the factory on November 21, 2008. Ever since Fiat overtook the factory in 2008, it was invested nearly 1.3 billion euros in making the old timely factory modern and suitable for meeting the latest standards of production. Nearly 2,500 people was employed and the factory's doors were officially opened in April 2012. By September that same year, the production of a newly introduced model (initially codenamed as "Project L-Zero") Fiat 500L has begun after its world premiere at 2012 Geneva Motor Show. As part of the global name change of Fiat Auomobili, Fiat Automobiles Serbia (FAS) changed its name in Fiat Chrysler Automobiles Serbia, Kragujevac Limited (FCA Serbia) to reflect the global name change. In October 2005, Serbian manufacturer Zastava reached an agreement with Fiat to assemble first, and later, produce this version under licence in the factory of Kragujevac city, Serbia naming this model as Zastava 10. After acquiring a majority stake in Zastava in autumn 2008, Fiat continued production of this vehicle under the Fiat Punto Classic name from March 2008. As of 2013, it remains in production. It is available with a 44 kW (59 hp) 1.2 petrol or CNG 60 PS and a 51 kW (68 hp) 1.3 diesel 70 PS engine. The Fiat 500L is manufactured at Fiat's Kragujevac plant in Serbia, previously the Zastava Automobiles factory, though it was initially intended to be manufactured at the Italian Mirafiori plant in Turin, but the highest salaries in the country, and poorlest labour relations between the parts resulted in the manufacturing of this car in Serbia instead of Italian factory of Mirafiori and a newly built Mexican plant. The Fiat 500L is a five-door mini MPV based on the design of Fiat 500 and was codenamed Fiat L0 (or Ellezero) during development and was initially scheduled to be launched in 2011, but was delayed until the 2012 Geneva Motor Show, and later in the 2012 Los Angeles Auto Show. It was scheduled to be sold in Europe and Canada towards the end of 2012, in the United Kingdom in April 2013, and was on sale in the United States in 2013, and in Latin America by the start of 2013. Altogether, the 500L is going to be for sale in over 100 countries. Fiat Campagnola – 1953–1962. 9,089 built without modification. Fiat 1400 – 1954–1961, without modification. Fiat 1100R – thousands produced. Zastava 750 (later 850), nicknamed "Fića", 1955–1984. 923,487 produced with some modification. Fiat 615 – medium truck produced by Zastava Kamioni from 1957–?. 36,000 built. Fiat 1300/1500 – 1962–1979. 201,160 without modification. Fiat 850 – A modified/stretched FIAT 600D passenger compact car thousands produced. Fiat-OM 40 – 1969–1980s A 12 t lorry based on the original 1970s OM 40 with Fiat truck engine and some with 4X4 for the army. Zastava Skala – Fiat 128 based with many body modifications. 1971–2008. 1,273,532 built. Many built in Egypt by Nasr. Zastava Koral (Yugo 45) – 1980–2008. 750,000 built. More than 150,000 Yugos exported to the USA. Global production: 794,428. Fiat Daily – 1991–? IVECO owns 46% of Zastava Kamioni. Zastava Florida (Yugo Sana) – 1988–November 2008, 29,950 built of the second series. Zastava Z10 (Fiat Punto II) –2006–2008; 4,224 units built. Fiat Punto Classic– 2008–2011, 2013–present; 41,000 built. Fiat 500L – Production started in 2012. 1 2 3 4 5 Основни подаци из консолидованог финансијског извештаја за 2013. годину. Агенција за привредне регистре Србије (in Serbian). Retrieved 2 July 2014. ↑ "Fiat Investing $1b into Zastava". Macedoniaonline.eu. 28 July 2008. Retrieved 29 November 2008. ↑ Judah. The Serbs. Yale University Press. ISBN 978-0-300-15826-7. ↑ "Serbia puts carmaker Zastava on sale". Autonews.com. Retrieved 2007-12-28. 1 2 "History" (in Serbian). Zastava-Automobili.com. Retrieved 2012-09-19. 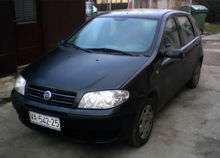 ↑ "Zastava Automobili:". ZastavaNacionale.com. 2008-08-26. Retrieved 2009-07-08. 1 2 3 "Zastava Automobili: 1950s". ZastavaNacionale.com. Retrieved 2010-09-27. 1 2 3 4 5 "Zastava Automobili: 1960s". ZastavaNacionale.com. Retrieved 2008-12-06. ↑ Anderson, Donn, ed. (March 1993). "Brieflys...". New Zealand Car. Auckland, New Zealand: Accent Publishing Cnr. 7 (5): 14. ISSN 0113-0196. ↑ "All Our Dreams Were Destroyed – Meeting and tour of Zastava factories in Kragujevac". Agitprop.org.au. 1999-08-22. Archived from the original on September 27, 2007. ↑ "The Skoda Model". Globalpolitician.com. Retrieved 2008-12-06. ↑ "Entrepreneur plans U.S. comeback for the Yugo". Invest-in-Serbia.com. Retrieved 2008-12-06. ↑ "Yugo Redux". Forbes.com. 2002-04-23. Retrieved 2008-12-06. ↑ "Chinese autos to land in area dealership". Dispatch.com. Archived from the original on May 23, 2011. Retrieved 2008-12-06. ↑ "ZASTAVA 10". Zastava10.com. Retrieved 2008-12-06. ↑ "ZASTAVA-AUTO.DE – BELGRAD SHOW 2006". Zastava-Yugo.de. Retrieved 2008-12-06. ↑ "Zastava: End for Yugo, Florida and Skala". Emportal.rs. Archived from the original on January 16, 2016. Retrieved 2008-12-06. ↑ "Fiat signs agreement with Serb govt to acquire Zastava's Kragujevac plant". CNBC.com. 2008-04-30. Retrieved 2008-04-30. 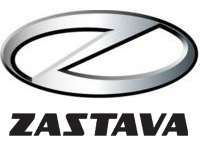 ↑ "21.11.2008 NEW CHAPTER OPENS FOR ZASTAVA AS LAST CARS ROLL OFF THE PRODUCTION LINES". Italiaspeed.com. Retrieved 2008-11-22. 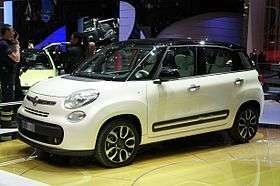 ↑ "Larger Fiat 500L to Debut in Geneva Next Month". Wall Street Journal. 2 February 2012. Retrieved 28 February 2012. Jason Vuic, The Yugo: The Rise and Fall of the Worst Car in History. New York: Farrar, Straus & Giroux, 2009.